Magnetic resonance imaging (MRI) of the hand and fingers has benefited from the use of dedicated surface coils, which allow a fine depiction of the intricate anatomy of these structures, owing to high spatial resolution images as well as an excellent soft tissue contrast. Optimization of numerous imaging techniques and approaches is important in today’s costconscious environment. Any number of imaging methods, either alone or in combination, can be used to evaluate the hand and fingers. These techniques include routine radiography, scintigraphy, diagnostic ultrasonography, computed tomography (CT) scanning, arthrography, and MRI. 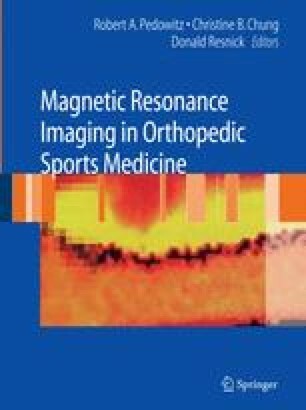 In this chapter, the role of MRI is addressed, and MR techniques are discussed. The evaluation of the hand and fingers with MRI is optimized by a high-field (>1.0 tesla [T]) system. The role of MRI has continued to evolve as innovations have expanded in pulse sequencing and high-resolution imaging, including MR arthrography, angiographic techniques, and 3.0-T imaging. Recent studies have demonstrated that MRI has significant usefulness and has impact on clinical decision making in a significant number of patients. Hobby et al. demonstrated that magnetic resonance (MR) studies have changed the clinical diagnosis. 1.Service de Radiodiagnostic et Radiologie InterventionnelleLausanneSwitzerland.